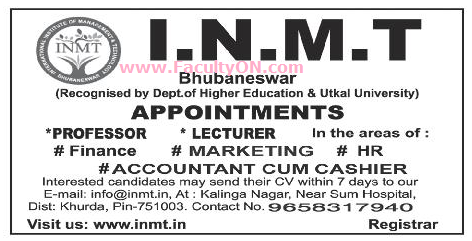 I.N.M.T Bhubaneswar has advertised in the SAMAJA newspaper for the recruitment of Teaching Faculty- Professor / Lecturer Plus Non-Faculty jobs vacancies. Interested and eligible job aspirants are requested to apply within 07 days from 16th July 2018. Check out further more details below. About College: INMT offers the Management, Financial and computer application education more than just business management at its well-located campus in the Capital. With curriculum bench marked against the best in the country the INMT provides the approach to pedagogy which combines fieldwork, case studies and instrumented feedback with a strong emphasis on concepts and theory. How to Apply: Interested and eligible candidates are requested to send CV along with copies of certificates and recent passport size photo to the email address or postal address given below.